In Malawi there are too few maternity healthcare workers to enable delivery of high quality care to women. These staff are often overworked and have low job satisfaction. Skilled maternity healthcare workers are essential to improve outcomes for mothers and babies. This study focuses on understanding the working life experience of maternity staff at district hospitals in Malawi with the aim of developing relevant low-cost solutions to improve working life. A qualitative study using semi-structured interviews was undertaken in three district hospitals around Malawi’s Capital city. Thirty-one staff formed a convenience sample, purposively selected to cover each cadre. Interviews were recorded, transcribed and then analysed using Interpretative Phenomenological Analysis complemented by Template Analysis to elicit the experience of maternity staff. Staff describe a system where respect, praise and support is lacking. Many want to develop their skills, however, there are barriers to advancement. Despite this, staff are motivated; they are passionate, committed professionals who endeavor to treat patients well, despite having few resources. Their ‘superdiverse’ background and experience helps them build resilience and strive to provide ‘total care’. Improving working lives can improve the care women receive. However, this requires appropriate health policy and investment of resources. There are some inter-relational aspects that can be improved with little cost, which form the ten recommendations of this paper. These improvements in working life center around individual staff (respecting each other, appreciating each other, being available when needed, performing systematic clinical assessments and communicating clearly), leadership (supportive supervision and leading by example) and the system (transparent training selection, training being need driven, clinical skills being considered in rotation of staff). To improve working lives in this way will require commitment to change throughout the health system. Thus, it could help address preventable maternal and newborn deaths. The health system and the workers within it are essential for enabling good maternal health . However, there is a shortage of healthcare workers (HCWs) in the places that need them most. Despite this issue gaining increasing attention over the last decade , the Global Health Workforce Alliance estimates a shortfall of 12.9 million skilled HCWs by 2035 . Skilled providers reduce maternal mortality . The World Health Organization (WHO) predicts that good quality care at delivery could reduce the 300,000 annual maternal deaths by over one-third, the number of stillbirths by over 500,000 and neonatal deaths by 1.3million [1, 5]. Skilled providers are essential for care at delivery. Many countries with high maternal mortality rates fall below recommended staffing levels . Insufficient numbers of HCWs affects both the quality of care for women, and the workload of other staff. Providers are overworked, have less opportunity for interaction with colleagues and consequently face reduced job satisfaction . A focus on the working life experience of HCWs may identify locally appropriate strategies to improve working environments for staff, thus enabling an improvement in their performance . The Malawian government have been addressing this issue for a decade , but the improvements that have been made are fragile . A recent service provision assessment, revealed that a skilled birth attendant was available 24 h a day in fewer than 90% of hospitals, and only one-third of clinics . This undoubtedly contributes to the high maternal mortality ratio in Malawi of 510 per 100,000 live births . This study aims to understand the working life experience of HCWs at district level facilities in Malawi. It will illuminate the positive elements of their working lives, the challenges they face and enable relevant solutions to be developed. This qualitative study used one-to-one interviews with HCWs and combined two approaches to data analysis to allow a powerful picture of experience to be formed. Interpretative Phenomenological Analysis (IPA) harnesses the lived-experience in an in-depth, bottom-up approach using solely the data from participants. This approach was employed to identify core themes in an intensively-analysed sub-sample of the interviews . Template Analysis(TA)  is a top-down approach, which was used to extend and develop these themes across the remainder of the dataset. This combination has been employed in previous studies  and benefits from the combined strengths of each approach. TA complements IPA as a flexible means of developing and transferring the coding structure within a larger sample [13, 15]. The study took place near Malawi’s Capital. Participants were recruited from three government hospitals; a district referral center, a district hospital and a community hospital. The district referral center had approximately 15,000 deliveries annually. Care was delivered by consultant and trainee obstetricians, general practitioners, clinical officers, degree level or registered nurses, diploma level nurse midwife technicians, trained nursing auxiliaries and untrained patient and hospital attendants. The district hospital, with approximately 3,700 deliveries annually, had no doctors who deliver obstetric care but had the other cadres. The community hospital with approximately 4,700 deliveries per year had no doctors or nursing auxiliaries. IPA requires participants to have a shared experience, to enable exploration of the common or conflicting ideas within and between cases . Here, the common perspective was working in a government hospital in Malawi. A sampling technique of convenience was used to access those staff who were available when the researcher was present. This was complemented by a purposive approach to ensure different cadres of staff were represented. A sample of six to nine participants was desired for the IPA element of the study as this is the volume of cases for which we felt in-depth experiential analysis was feasible. Beyond that, we wanted to gain a broader perspective of the range of staff and also allow staff who wanted to participate to share their stories. We determined that approximately 10 interviews per site would allow both of these goals to be met. Following ethical approval from the Universities of Malawi and Birmingham, HCWs of all cadres were invited to participate in the study. After obtaining written informed consent, interviews were arranged with staff at a time convenient to them and a unique identifier (pseudonym) allocated. Semi-structured interviews lasting 30–90 min were carried out using a topic guide (Additional file 1), recorded and then transcribed. Participants were invited to receive their transcript, and several requested this, although only one made minor alterations. IPA required a detailed analysis of a small number of cases . Nine cases, with the richest experiential data, spread across sites and cadres of staff were selected. These transcripts were read, re-read, then coded by hand by AMe and in part by ML. Coding focused upon capturing the meanings of important work-related experiences, from the respondents’ perspective. The research team then reviewed the emerging themes and feedback was sought from participants. These themes formed a ‘template’ for the second phase of analysis. This was carried out independently of the IPA, allowing the analysis to be grounded in the lived experience, but also to cope with the volume of data collected. This template was then applied to nine interviews using the qualitative software NVIVO version 10. The sub-themes were modified to incorporate new ideas, before being applied to the remaining dataset. During the application to the remaining dataset, no further themes were added. Each coded theme was explored further. The data was analysed by understanding the distribution of codes across the data. The relationships between themes were then explored. This was carried out by drawing out key ideas from each case and creating individual ‘maps’ of the key themes. Ideas that corroborated or were polarised were identified and considered across cases in addition to within cases this provided the opportunity to develop the contents within each theme more fully [17, 18]. AMe undertook the interviews and analysis. As a medical doctor with a background in obstetrics and gynaecology this PhD student based in the UK, brought a clinical perspective to the analysis. ML provided supervision and triangulation on the developing analysis from the perspective of phenomenological psychology. Interviews were carried out with 31 HCWs at three sites (Table 1). An overview of the thematic structure is presented in Table 2. It is important to understand the context of work for these HCWs (Table 3). They described difficult working conditions with too few staff, resources, low pay and poor facilities with an increasing number of patients. Treating all patients well; Physically, socially and spiritually. Hierarchical relationships were a divisive but systemic feature of participants’ accounts of their interpersonal interactions. For example, Alile, a nurse midwife technician(NMWT), described a ‘demarcation’ between staff that exists between and within cadres. Paul a clinical officer(CO) believed this hierarchy ‘play some some role in um actually weakening the teams’. Staff felt inferior ‘we don’t have any due[feel able to] to tell them what, what can we do’ and uncared for ‘they don’t regard us they don’t look at our welfare’ (Alile NMWT). Staff had insight into the effects of this hierarchy. Victor, CO, felt that ‘sometimes I may not be humble enough to take their[nurses’] suggestions’. ‘Sometimes they can come in the morning, they just walk walk [through] then they go out…the in-charges…the matron eeh is so difficult…yeah, she come here but she don’t work. She just stay, then she go, she come at lunch eat, go.’(Rhoda, NMWT). The lack of support extends to being transferred, a situation in which staff feel that they have no control. For example. Alile struggled to cope with the idea of being transferred because, ‘they can…remove me from here to work somewhere regardless of my feelings and how can I cope with the other ward’. In addition to this being personally challenging, it could leave wards with inexperienced staff: ‘as for maternity we don’t have lots lots of those experienced ones it’s just a youthful generation’ (Kennedy, NO). Many HCWs felt that ‘the dream I had, I have fulfilled’ (Ellen, NMWT). Victor a CO described a common motivation of helping people: ‘I wanted to be…one of the people that could be helping other people’. Staff felt recognised, respected and appreciated when approached by patients. As with Vincent, they spoke of these experiences fondly and found them motivating. HCWs identified as professionals and wanted to do a good job. For example, when there was a staff shortage, the ward in-charge showed commitment and came in to ‘make sure that care of the patient is not compromised’ (Kingston, NO, in-charge). Kingston later reflected that ‘there’s a lot of things in our facility that are supposed to be changed’, this showed an understanding of the need to make changes, perhaps the first step in taking responsibility. However, Kaia, a patient attendant, described how people working together ‘can’t agree on everything’ but they needed to behave in a professional manner and ‘concentrate on the positive things and meeting the goal for our jobs’. Theresa, NMWT, described how as a professional ‘you need to care psychologically, socially, physically….spiritually’ for your patients. This meant providing high quality, respectful care, which could be challenging especially when ‘the women sometimes they irritate you’ (Alile, NMWT). Natasha, a CO, recognised that this was challenging for some staff because ‘they will come with their own problems at home’ but still she doesn’t ‘think you can just come here and start shouting at everyone it’s not on’. Alile described how instead ‘you just make your heart to calm’. ‘Patients rush to the wards. Can you please assist us, the clinician is not there. So we are the ones may be admitting the patients, prescribing drugs…clinicians are the ones who know more about drugs than a nurse.’ (Rachel, NMWT). Perhaps because the ‘clinician [CO]…is not coming’(Brenda, NMWT), nurses needed to make clinical decisions. Victor, CO, described how he operated on patients without assessing them because the patient ‘is already there’. To compound this issue, there was delay, because nurses believed they were more skilled than clinicians and so called for help only when ‘maybe we have failed that’ (Vincent NO). Many HCWs like Kingston, NO, felt they ‘need to go back to school to further my education’. This motivation could have been driven by a desire to help patients, but in many cases, upgrading provided the opportunity to improve job prospects: ‘there are better salaries than what I am getting here now’ (Rhoda, NMWT). Upgrading was not easy. Staff often have to go back to secondary school. Getting a first degree was still a ‘challenge’ but according to Marshall, a CO ‘after first degree the world is open here in Malawi’. The competition for places to upgrade was fierce and many like, Alile, NMWT, felt that ‘the chance is very low’. HCWs recognised that ‘experience is a good teacher’ (Pricilla, NMWT). They appreciated learning from each other and learning something from a lower cadre could be particularly memorable: ‘suturing itself I was taught by a maid [patient attendant]…I still remember that suturing even though the patient attendant doesn’t know suturing but since they have been there for years’ (Natasha, CO). HCWs wanted allowances because they ‘could have been at home, doing some other things that could have brought us some monies’ (Sasha, NMWT). Training sessions often resulted in more work, implementing interventions. Ellen, NMWT, felt that without incentives ‘they say I haven’t received anything I will work as I am supposed to work so they don’t even implement those things’. There was a feeling of unfairness about training sessions, according to CO Aubrey, ‘they don’t balance chances of attending meetings’. Theresa, NMWT described how ‘most of the time they consider the registered ones so you are always on duty…so that makes us down’. This could feed into staff becoming demoralised. Staff came from different perspectives and backgrounds. This multilayered complexity within the population of HCWs reflected superdiversity . Some, like Cynthia, NO, were motivated by ‘that feeling of helping others’, whilst others were motivated by personal experience. For example, when Francis, CO, was being a guardian to his father he ‘wasn’t much convinced’ with ‘the way they were attending…patients’. For others, being a HCW is a job ‘I wanted to become an accountant that was my dream…upon been applying to University of Malawi and been left out I had no choice’ (Ash, CO). Staff also had a diverse range of prior experience. For example Francis ‘was a teacher myself’. Memory, NMWT, had a wealth of experience, having ‘qualified in 1986’ and worked in ‘different kinds of nursing’. Violet, a matron, saw the importance of experience because staff bring ‘new ideas…how they were doing things…in their various hospitals’ which could ‘assist us to change’ and ‘learn new things’. Staff had different challenges at home, especially the women, ‘the child is sick…we come here thinking how’s my kid at home so sometimes being a working mother…that’s a challenge’ (Roshin, NMWT). HCWs display resilience, an ability to cope with the difficult conditions in which they work. For some, this resilience is rooted in motivation and professionalism, or for others resilience is grounded in their self-belief. For example, Kennedy and NO, shows the vision that drives him: ‘I always believe…I could be that person, that single person that could bring change’. Some practical things helped staff in their working lives. Marshall, CO, described how ‘you should do cover’ when ‘my friend has going out’. Whilst the negative aspects of absenteeism are undeniable, having supportive workmates to rely on when you needed to ‘it really helps’. Cynthia, NO, described, how the incharge’s put ‘experienced people and working with inexperienced’ so that the ward ‘does not want’. I always try to not be a superhero…I would rather a consultant watch...next time I’m faced with that situation I know exactly what to do. Personal resilience could be built, for example by diversifying income as described by Natasha, CO, ‘I have a shop in town’. Whilst some have extra jobs that resulted in absenteeism, others like Natasha were able to manage their extra earning around work ‘most of the time is her who takes care I just go there for stock taking and everything’. Family builds resilience as staff have to ‘actually find some time to go visit the family’(Paul CO). Staff could also ensure that they coped by asking ‘for an off to rest’ (Rhoda, NMWT). The general ebb and flow of clinical work could help as sometimes it was quiet ‘yesterday we only had a single patient, so I was just seated there’. Finally, HCWs ‘are socially people who are respected so being a nurse, it’s good’(Kingston NO). This positive reception, bolstered staff morale and built their resilience. Maternity HCWs in Malawi are delivering care within a challenging environment and whilst navigating complex interpersonal relationships. These factors make work life challenging and erode the ability to provide excellent patient care. Despite this, staff seemed intrinsically motivated and draw on their resilience as a person and a team to care for their patients. A strength of this study is that it provides insight into a cross section of district level hospitals in Malawi. The complementary IPA and TA approaches allow an in depth understanding of the data whilst incorporating the breadth of responses. Whilst these facilities were based only in two districts, and with a limited number of staff, staff of all cadres were invited to share their views. However, due to time and resource constraints, no ward clerks and only a few doctors and auxiliaries participated in the interviews. Having said this, when conducting the template analysis for the final 13 interviews, no new themes emerged. This may suggest that our sample did enable us to gain a good picture of the experience of healthcare workers. Despite this small sample size, the findings of the study are in-keeping with similar studies in low-resource countries. This may mean that the findings could be considered useful in other comparable settings. Well-functioning interpersonal relationships are vital to delivering care, however, a functioning health system also requires thoughtful health policy and resources. 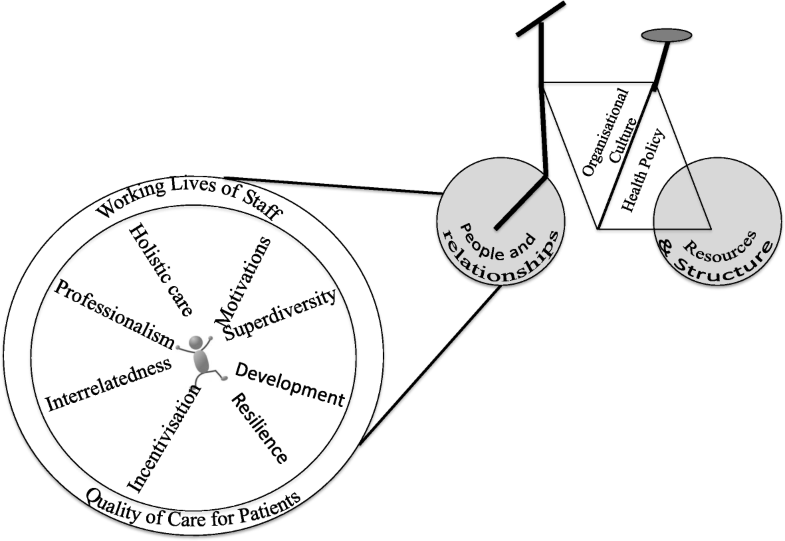 This is illustrated using the health systems bicycle (Fig. 1). For the health system to travel towards high quality care all components must function well. When considering the inter-relational aspects within the health system, each ‘spoke’ is important to ensuring the wheel can keep turning, as is each element identified in this study important for HCWs. Learning from each element and developing positive solutions to strengthen each ‘spoke’, can allow for better support for working lives and patient care. Unlike the ‘health resources’ wheel, many of the solutions to improve interrelatedness require no or few additional resources, but instead personal commitment from healthcare workers and a supportive framework of health policy. With this in mind ten recommendations have been developed. Staff feel that they work in a hierarchical system which demoralises them as individuals and weakens teams, treating each other with greater respect could go some way to improving this. Further motivation could be fostered by openly appreciating colleagues. Being available when other members of staff need you may be more challenging, as HCWs are operating within difficult personal circumstances too, but it would improve relationships between staff and care for patients. Once with a patient, performing a systematic clinical assessment can improve clinical decision-making. Communicating clearly can improve patient outcomes and increase the likelihood of a satisfying good outcome. Leaders should lead by example. By leaders avoiding clinical work staff cannot be blamed for wanting to escape clinical work. A generation of excellent clinical leaders could provide a foundation for positive change within the health system. Perceived unfairness in selection for training and further education demoralises staff. Creating a transparent and fair system for selection could alleviate some of these feelings. As illustrated in the incentives theme, staff value allowances more than the training, ensuring training is targeted to staff needs could begin to address this issue. For this to change staff, the government and donors will need to develop an open dialogue. When staff are relocated in the regular re-assignments that occur, the clinical needs of the hospital and district must be a priority but staff’s personal needs should also be considered. HCWs are not generic, they have different specialist skills and experience. Appreciating this could improve the skill-mix of staff enabling better patient care and senior support. Additional evidence for each of these ten recommendations is presented in Table 4 where you can see that many of these observations are not new or confined to Malawi. However, to our knowledge these strategies have not been collected as a suite of low-cost recommendations. For example, studies from Malawi [20–24] and elsewhere [25–28] show that HCWs would like access to training opportunities, supportive supervision and appreciation from their colleagues. This study has provided an insight into the working lives of maternity healthcare workers in Malawi at an important time. The international maternal health community is shifting its focus onto the Global Strategy for Women, Children and Adolescents. The ten low-cost strategies identified in this study could be used to address two of the strategic priorities for ending preventable maternal and newborn mortality and stillbirths: strengthening care around the time of birth and strengthening health systems . Thank you to all the staff who took their time to participate in the study and feedback on the initial themes. Thanks also go to Zione Dembo, Allan Mchenga and Rashid Deula for transcribing the interviews and Nicola Smith for finalising the transcriptions for analysis. This study was funded jointly by Ammalife a UK registered charity and a seedcorn grant from the Institute for Research into Superdiversity at the University of Birmingham. The fees for Open Access Publication of this article were kindly provided by the University of Birmingham. The funding bodies had no role in the design of the study, collection, analysis or interpretation of the data or writing of the manuscript. AMe and AC conceived the study, the methodology was developed by AMe, AC, JH, ML. AMe carried out the interviews. AMe and ML analysed the interviews, AC, JH, AMa contributed to theme development. AMe wrote the first draft of the manuscript and all other authors edited the manuscript. All authors read and approved the final manuscript. Ethical approval was obtained from the University of Malawi College of Medicine Research Ethics Committee on 27th February 2015 (number P.09/14/1635-). In addition, University of Birmingham ethics approval was obtained prior to this on 30th October 2014 (ERN_14–0878). Participants were provided with a participant information sheet and asked to sign a consent form prior to the interviews being undertaken. Pseudonyms were allocated to each participant to maintain their anonymity. World Health Organization. Malawi: WHO statistical Profile [Internet]. World Health Organsiation: World Health Organization; 2015. [cited 2016 Mar 13]. pp. 1–3. Available from: http://www.who.int/gho/countries/mwi.pdf?ua=1. Wurie HR, Samai M, Witter S. Retention of health workers in rural Sierra Leone: findings from life histories. Hum Resour Health. 2016;14(3):1–15. https://doi.org/10.1186/s12960-016-0099-6.